Chen Xinyi Hunyuan Master Ou Hai Bing, Zhuzhou - The China Taichi Guide is a Directory of Tai Chi Schools & Tai Chi Teachers in China. 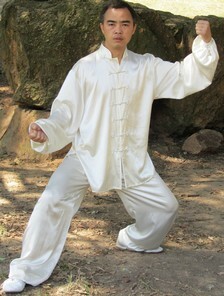 He also teaches Competition Chen 56, Chen Sword and Hunyuan Qi Gong and occasionally Simplified Yang 24 and 42 Form. His Tai'chi movement is superbly relaxed and beautiful to watch, and he combines this with a natural humility and enthusiasm to share what he has with his students. A very nice guy. Master Ou started his martial art training at the age of 5 learning with his grandfather who was a Southern Kungfu (Nanquan) practitioner. He continued training throughout his childhood and at the age of 16 started learning Wu Style Tai Chi which he continued until the age of 27 learning first with a teacher in Zhuzhou and then later from the age of 24 with the Wu Style Grandmaster Li Bing Ci in Beijing. Around this time he also spent a year in Wudang practising Wudang Kungfu before switching his focus to Chen Style Tai Chi with Master Dong Jie who was a class peer of Chen Zhao Xu, Chen Xiao Wang's father, and Feng Zhi Qiang. At the age of 31 he became a disciple of Feng Zhi Qiang and studied seriously with him until the age of 37 before returning to settle in his home town. Master Ou lives in a very quiet neighbourhood on the edge of a hilly country park on the outskirts of Zhuzhou, Hunan about an hour by bus from Changsha. There are many outdoor places to practise on the hill and some covered areas around formal gardens so this is a good area to train. Master Ou does not speak English, but has students who do. He assured me he will do his best to have a translator present during his classes. It should be fine to rent rooms in nearby houses close to where he lives and there are affordable local restaurants to eat in so basic amenities are fine. He said he can help out with all this. Prices for monthly rental are 20-30Y per night in local houses, hotels 200Y per night. He teaches on a tutorial basis only and so this is an ideal opening for individuals with a Xinyi Hunyuan background looking to study advanced work for a week up to a month. I can also see that it would great for tutorial groups to get together and hire him, again for up to a month or two. He seems quite happy to teach students of all levels and proudly showed me videos of a local girl he has taught from the beginning for the past six months. Beginner students should have some contact with a Chen or Hunyuan teacher in their home country before considering contacting Master Ou. Training 3 hours per day, 6 days per week is recommended to get the most out of your stay, although slightly more or less may be also be possible. Contact : Master Ou Hai Bing. The China Taichi Guide : An introduction to the Chen Xinyi Hunyuan Master Ou Hai Bing. Ou Hai Bing is a disciple of Feng Zhi Qiang and has practised taichi, primarily Chen style & Hunyuan style since he was a young boy. 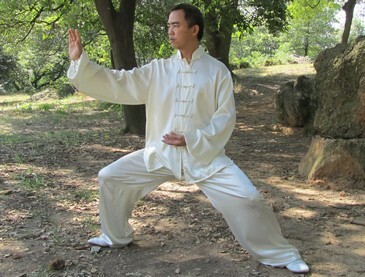 The China Tai Chi Guide is a directory of Tai Chi Schools and Teachers in China.